Seven years after the F30 first made its debut in Malaysia, it’s now time for the new G20 BMW 3 Series to take its place. The seventh generation of Munich’s benchmark sports sedan has just been launched here, less than six months after the car made its international debut. We’ll get to what you’ve all been waiting for, and that’s the price. 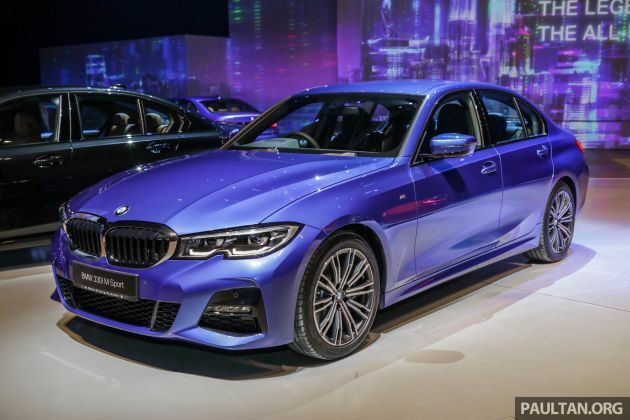 At launch, the G20 will be offered in just the single 330i M Sport variant, fully-imported (CBU) and priced at RM328,800 on-the-road without insurance. Included in the price is a five-year, unlimited-mileage warranty with free scheduled service. The new model is significantly larger car than its predecessor, measuring 76 mm longer (at 4,709 mm) and 16 mm wider (1,827 mm); its 2,851 mm wheelbase is also 41 mm longer. It is, however, only one millimetre taller than the old car, at 1,442 mm. The track widths are also wider by 43 mm at the front and 21 mm at the rear, which BMW says improves poise and agility. The exterior has been given a gentle revamp and is dominated by the massive double kidney grille, now joined in the middle. It is connected to the headlights, which have a notched shape similar to recent Peugeot models and feature full LED technology with enhanced functionality and U-shaped daytime running lights. Moving to the side, the proportions remain largely identical – the long bonnet and wheelbase, short overhangs and sweeping roofline give the car a typical sporty look. One change is that the trademark C-pillar Hofmeister kink receives a beveled edge on the top corner. Along the flanks, there’s an upswept contour line that draws the eyes towards the prominent character line over the rear wheel arches; BMW’s Air Breather vents, which usually sit aft of the front wheels, are notably absent here. The LED tail lights feature a three-dimensional L-shaped design and tinted lenses. The M Sport package on this car adds a sportier front bumper design with a large U-shaped centre air intake, along with protruding side skirts and a diffuser-style rear bumper insert with twin tailpipes. You also get 18-inch double-spoke Style 790 M two-tone alloy wheels, finished in Orbit Grey. Step inside and you’ll notice styling cues taken from other new BMW models such as the G15 8 Series, G05 X5 and G29 Z4, with a clear horizontal design, electroplated silver trim around the air vents and controls and a tall centre console. The latter gets a new control panel incorporating the starter button, a redesigned gearlever, the iDrive controller and a new electronic parking brake that replaces the old manual handbrake. As standard, the 330i comes with the range-topping BMW Live Cockpit Professional infotainment system, featuring a 10.25-inch centre screen and a 12.3-inch fully-digital instrument display with a reverse-direction rev counter. 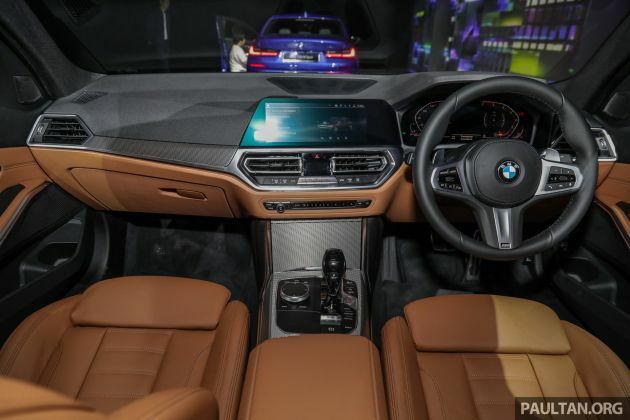 The upgraded system also incorporates the new BMW Operating System 7.0, featuring a revised user interface with larger panels. The system can be controlled through the centre touchscreen and the iDrive rotary controller. Also fitted is the Intelligent Personal Assistant, a more advanced voice control system that can learn the user’s routines and habits, similar to the Mercedes-Benz User Experience (MBUX) system. A 10-speaker, 205-watt HiFi Loudspeaker sound system comes as standard. Elsewhere, the sports seats have been redesigned for improved long-distance comfort and come with powered adjustment with driver’s side memory and Vernasca leather upholstery. Munich claims that cabin refinement – an area where the previous F30 has always fallen short – has been improved with measures to reduce wind noise, structural foam in the A-pillars and the use of acoustic glass for the windscreen. Increased interior space has also been claimed, including gains in front shoulder room, rear legroom and all-around headroom. Rear entry and egress has also been improved with an increaser door aperture height, and while boot space remains the same at 480 litres, a new partitioning system has freed up an additional 36 litres of storage space. Improved outward visibility has also been touted. Standard features include keyless entry, push-button start, triple-zone auto climate control, cruise control, Aluminium Tetragon trim, black headlining and Qi wireless smartphone charging. There’s also the BMW Digital Key feature that allows selected Samsung smartphones to be used as a key via Near Field Communication (NFC). As far as driver assists are concerned, the 330i comes with Parking Assistant for semi-autonomous parallel and perpendicular parking, plus a reverse camera and the new Reversing Assist system that will help you reverse out of a tight spot by recalling the way you came in. Unfortunately, there are no other assists of any kind, not even autonomous emergency braking, which is a glaring omission at this price. Under the bonnet sits the latest version of BMW’s B48 2.0 litre turbocharged four-cylinder petrol engine, making 258 hp (up 6 hp) and 400 Nm of torque (up 50 Nm) from 1,550 to 4,400 rpm. Paired with the ubiquitous ZF eight-speed automatic transmission, it goes from zero to 100 km/h in 5.8 seconds and delivers a fuel consumption figure of 5.8 to 6.1 litres per 100 km. Under the skin, the new 3 Series benefits from an increased use of aluminium and high-strength steels, so it’s now 25 kg lighter than before, weighing in at 1,545 kg. The new chassis delivers a 25% increase in overall rigidity, and features aluminium suspension components to reduce unsprung weight. The double-joint MacPherson strut front and five-link rear suspension uses specially tuned kinematics to improve steering precision and handling, while at the rear, rigid control arms and subframes and the use of thrust arms for body mountings ensure precise wheel location. For the first time, the standard chassis (with M Sport suspension on this car) is equipped with lift-related dampers that provides additional hydraulic damping at the front and limits compression at the rear. With continuously variable damping rates and progressive stiffness according to spring travel, the new dampers are said to provide a better compromise between comfort and sporty handling. 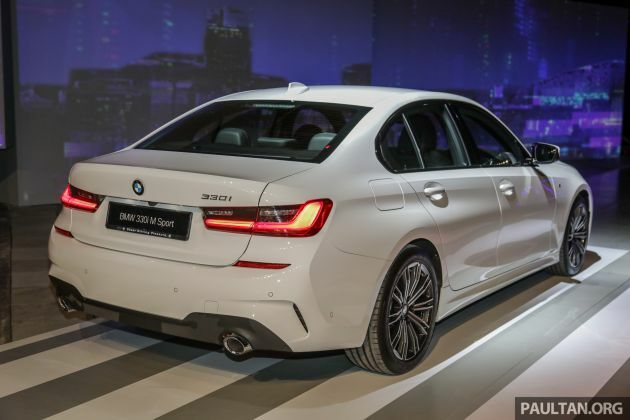 So there you have it – the new G20 BMW 3 Series is now here in Malaysia. What do you think of the specs and the price? Sound off in the comments section after the jump. For full specifications and equipment, check out CarBase.my. Is much wiser to spent that downpayment 33K to buy 1 apartment 300k. In five years, the apartment value go up to 600k. We then buy the same G20 BMW for 150k, dropped frm 330k. 320i? R u joking? 330i will be the new entry level. Or it might follow suit big brother where 330e will be the new entry level. RM330K?? Better spend about 10k more for the 550e. What kind of pricing is this with no AUTONOMUS EMERGENCY BRAKING!!! You are right but it’s a CBU model so best to do comparison when CKD kicks off. By comparison the Audi A4 2.0 TFSI Quattro retails for 335k has 4WD, a B&O sound system and LED Matrix headlights and taillights. To me paying 6k extra for all those sounds more promising. Only drawback Audi Malaysia does not have free 5 year service. Because our roadtax based on engine capacity. So better they bring the M3 that bring more power & output than M340i that also same roadtax price & engine capacity but less power & output. Same like 5 series in Malaysia, rather bring the M5 than M550i. Not related at all. Price-wise or performance-wise. Might as well suggest a Rolls Royce if you think there is an AMG C43 at 330k new. C43 AMG need to compared with M340i. This entry variant 330i should compared to C250 or C300. Don’t comment if cannot afford to buy this car. If you are born poor it’s not your mistake, but if you die poor it’s your mistake. Still no split folding rear seats? The lack of driver aids is probably not so bad cos this is after all the ultimate driving machine, not the machine that drives for you. Purists will not mind this, but non purists can look elsewhere and buy a W205 instead (the C Class is also better looking than the G20 to these eyes). But at least the G20 shld have warning systems if you go out of lane or to warn of vehicles slowing in front. Let’s hope the CKD version gets all these things right, and at a competitive price. Ok, based on the brochure, it does have through loading feature, so the rear seats do fold. The autocruise has a braking function, but without any driver aids, how would the system automatically brake during cruise control? However good this car is, the omission of advance safety system is unacceptable. How can they charge the same price as Mercedes (who should also be shamed for not offering their full safety suite in Malaysia) and not even offer AEB? Ridiculous pricing. 70k (!!!) price jump from 330e m sport, still no adaptive suspension, no driving assistant features (not even AEB), no BMW laserlights, no sunroof, no Harman Kardon speakers, wow. Even the c300 is a better buy than this. 329k without a proper driver assist? RM 330K, but will be more common on the road than a Corolla. Go figure. The car looks watered down without the signature 19′ wheels. Hope CKD will see the car being spec’ed with the signature 19′ wheels for the m Sport. I do agree that without AEB for our market is a glaring omission as the European market model has got it. I don’t know why BMW Malaysia does not bring in the model with AEB. Don’t compromise on safety. it would be nice the 330i priced at 330k. would that means.. the 318i be priced at 318k. 530i sells at 530k, 220i at 220k and 116i sells at 116k. Top up 1,200 you can get a E200 with Burmester Sound System. But this G20 is CBU and one segment below the E200. 330k for a 3 series is kinda hard to swallow for some buyers. As for me, I will opt for the 3 pointed star. E200 does not have Burmerter, please don’t sohai here. being an avid fan of the brand, the ludicrous pricing is a put off and ludicrous due to absence of the advanced safety features and others (sunroof, HK etc) at that price point! The king is back ! bye bye old uncle mercedes ! Suspensions of the c class is a total joke ! How does the price jump to 3X????? Move on la.. There’s always Grab or MyCar.. No one said you MUST buy a car. What more a Bimmer.. In US, nobody spend so much on a car either. Cost of living is high in different aspects. So.. Take a chill pill.. Or, like they always say, you can always opt to leave there. you seriously begin to sound like a broken record, sounded intelligent when you said it once but now it just seems foolish, let me tell it to you in terms that you would understand, lu tak suka, lu keluar!!! p/s can we avid readers band together and dont entertain certain trolls (clowns) like him and john then perhaps maybe they would just stop! One can only wish for the CKD version to have AEB plus other driver assists like lane departure and blind spot monitor. BMW Malaysia also took out the adaptive dampers which was standard in the F30. CKD G20 320i M Sport with passive M Sport suspension anyone? Do not freaking compare geely/proton with bimmer. For this high price, u don’t get the highest specced lighting system, no advance safety system, no stitched dashboard… U really need to act impulsively to fork out this money for something so little. Check out review overseas. All praise how this car drives and the tech and safety system. Here is a shame case! Once a brand stays top spot for too long, it will exploit the customers for maximum profits. Clearly Mercedes and BMW are exploiting customers! Although CBU and CKD comparisons isn’t completely fair but at almost RM330k its nearest competitor is its own older brother the BMW 530i at only RM43k premium at RM372k but with a plethora of additional features including harmon kardon sound system, sunroof, heads-up display, adaptive suspension with an adaptive driving mode, lane keep assist with steering vibrartion, front collision warning and automatic braking, blind spot monitoring and rear cross traffic alert, 4 zone climate control, automatic kick to open powered tailgate, rear seat occupants manual sunblinds and more…besides obviously with the premium you’re getting a larger car. Shld do away with gear shift lever. I dont think 318i or 320i will be offered anymore judging BMW’s marketing trend in Malaysia. Those are too puny for Malaysian. I think the new entry-level for BMW will be the 30i not 20i. But i do hope M340i will be offered as Im waiting to opt for that beauty. Can’t wait for the M340i X-Drive to come, just love the sweet sounding 6-potter. Nice car… nice interior but cant get over with the over-sized kidney grill..
What I dont really like is why manufacturer keep on increasing the size of cars… Just keep the size of 3 series like a 3 series… not 3 series with the size of 5 series..
Hopefully the B48 engine is much more reliable than N20.. so far havent heard of serious problem of B48 engines..
No more BMW for me as they have taken out all the features (Lazer lights/sunroof/safety features/harman kardon/19 inch rim/driver assist). This is daylight robbery, its not about money at this point its about consumer rights. Well done BMW Malaysia, 2019 will be Mercedes year once again ! I thought the highest price would be around 280k but…………… ! I was waiting to change my F30 to G20 since the day i saw the launching last year , but hack the offered feature turn me off. Should i get this just to fill the “Me First” feeling or wait for next year with better deal? complain this complain that…this car CBU la…nak apa lagi…. Shame on you BMW Malaysia that not paid attention with Proton X70 (even that is SUV but that SUV C segment should more expensive than C segment sedan) that RM200k cheaper than this G20 but X70 can give Autonomous Emergency Braking, Adaptive cruise control and any active safety feautures. Not having autonomous emergency braking is unacceptable. It is a very basic safety features for car in this era going into 2020! I can understand the Lazer lights, sunroof, harman kardon, 19 inch rim with adaptive suspension, driving assistant pro are omitted coz BMW saves this for their next FL model as standard equipment. Burmester on the C class is not more Superior to the HiFi sound system on F30 to my ears. Adaptive suspension good to have but not the C Class airmatic that has a few reported issues from C350e owners. Driving assistant pro or semi autonomous driving is only offered in the E350 recently. So BMW 3 Series were to offered this will be something of a good selling point to get back their market share from C Class. As this will be be trickled down to the next C Class W206. Potential 3 series and C Class customers now are more tech savvy now. It will be a big point to choice this over a C Class. Hope BMW Malaysia is going into this direction. Add in 360 Camera, AEB, and Driving Assistant Pro to give a good fight to win back the share market from Mercedes.